The radius in the fretboard will be added after the fretboard is glued in place. Now take the trussrod we made in Stage 6) and slide into truss trench pushing through the hole we drilled in the heel and add the washer and trussrod nut. For this next stage we are going to use Titebond wood glue. I prefer this glue because of the ability to heat the neck in the future if the neck needs any adjustment in curvature. I will talk more about this in the future either in the blog, newsletter or eBook. The repair tips show how the JCSMI Crossbow 2 and the JCSMI Hammerhead can help in this process. I like to wipe some Acetone on the glue faces of both the fretboard and neck blank using a lint free rag. I use a 2″ putty knife to spread the glue. Use a soft paintbrush to dust off the glue faces. Lay the fretboard on its backside an layout about a 10″ bead of glue. Use this glue first to lay the fillet in. Take the fillet and lay both sides of the fillet in the glue. Now press the fillet into the truss rod channel and locate it for final setting. 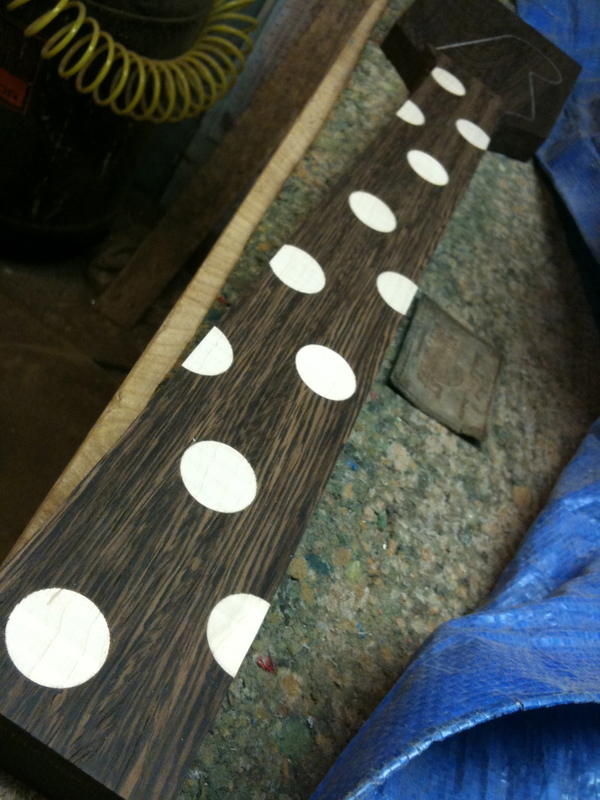 Then spread out the glue on the backside of the fretboard until it is complete covered. Apply a bead of Titebond from the heel of one side of the truss rod trench down toward the nut area and around then back down the other side and end at the heel. Now press the fillet into the truss rod channel and locate it for final setting. Take the putty knife and smooth out the glue evenly on the wood blank. Line up the fretboard and press down and check to make sure the center lines are lined up. Hold down and press out the extra glue just using your hands for the next minute or two. Next get 16 adjustable clamps. We also need two pieces of flat wood cut close to the shape of the fretboard to sandwich the neck when clamping. We also need two strips of wax paper on the top and bottom of the neck to prevent the neck from sticking to the wooden culls used to generate the clamping pressure. We need to start by using 3 clamps to set the fretboard. Lightly screw one in the middle then one on each end. Now place one clamp on each side of the neck starting near the center of the neck, then 2 more from side to side working toward the headstock. All 8 clamps should be equally spaced on each side of the neck. The pattern will look like this : : : : : : : : when done. After last 2 at the nut location, start back near center and work your way towards the heel. Make sure your centerlines do not move. When all the clamps are set, go back to the center two and snug up the clamps working your way towards each end. The glue should be running out evenly around the whole fretboard.